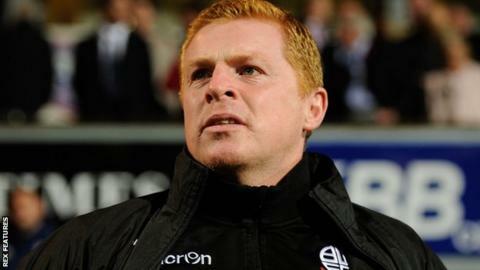 Bolton have "no money" to bring in players, says boss Neil Lennon. Wanderers, who sit 23rd in the Championship, have a debt of £172.9m and are seeking investment. Earlier this week, the Trotters announced chairman Phil Gartside is "seriously ill" and Trevor Birch will lead any takeover talks in his absence. "Trevor's come in and he's here to accelerate the process of looking for potential new owners and I think time is of the essence now," said Lennon. He told BBC Radio Manchester: "Otherwise we could be facing the scenario, maybe down the line, of administration so it's important the process is hurried along now. "I've been told there's no money left to even bring in loan players so the club needs an injection. "It needs someone who's going to come in and safeguard its future, not just on the field but off the field, but these things take time and getting the right people in is important." In the absence of Gartside, former Chelsea chief executive Birch, 57, has been appointed to lead negotiations on behalf of owner Eddie Davies. Gartside has been chairman for 16 years at Bolton, during which time they spent 11 years in the Premier League and played in the Uefa Cup. His health had been poor for several weeks but Lennon said there has been an improvement. "It's a huge blow not only professionally for me but also personally because Phil has been my boss but he's also been a very good friend," he added. "Obviously we're concerned about him and we're hoping that he has a speedy recovery - I was speaking to him yesterday and he said he was feeling good which is a great sign."